As far as we know the oldest glass shop in the World. Hieronymus Fritzsche descended from an old family of glass traders in Bohemia. After immigrating to Denmark in 1788, he started trading glass and chandeliers in Gothersgade 46 and in 1809 he moved his store to Kongens Nytorv 23. In 1790 he married Maria Xaveria Schürer von Waldheim, whose father also traded glass; he owned a glass shop in Østergade 61. Maria's family had traded glass since 1500, when her forefathers emigrated Saxony for Bohemia, founded numerous glassworks and traded glass and later chandeliers. In July 1592 King Rudolf II knighted the Schürer family for its great efforts in expanding Bohemian glass industry. Hieronymus and Maria had one son, Carl Edward, born 1809, but in 1819 Maria died. In the following year Hieronymus remarried Johanna Bittner, who was also a Bohemian descendant. In his second marriage his got a daughter, Henriette, who married Anders Fonnesbech, the founder of the well-known fashion house. Their private addresses are unknown. Carl Edward Fritzsche took over the glass shop at the death of his stepmother Johanna in 1834. The same year he married his cousin, Wilhelmine Schüre von Waldhein, the daughter of Franz S.v.W., who had taken over the glass shop in Østergade 61 from his father. In 1840 Carl Edward moved his shop to Østergade 24, and on December 31 1840, King Christian VIII designated him Court Glass Merchant. In 1839 the shop was moved to Købmagergade 3. Carl Edward was widowed in 1856, but remarried his stepsister's sister-in-law, Frederikke Fonnesbech. It is unknown where they lived in winter, but in summer they moved to the countryside at Bülowsvej, today central Frederiksberg. Married Marie Engelstrup in 1867, and as newlyweds they moved to Købmagergade 3. After moving to first Landemærket 7, then Slagelsegade 6, they lived in Østerbrogade 78 until his death in 1892. Married in 1897 to Gerda Bjerre Knudsen, the daughter of ribbon trader Johan Knudsen, Østergade 42, granddaughter of Distilled spirits merchant Mathias Bjerre, Toldbodvej. In 1912 Fritzsche moved the glass shop to Amagertorv 14. As newlyweds Gerda and Carl Emil lived in Nørre Farimagsgade and after several relocations they lived in Rosenørns Allé 35 until his death in 1930. Moved around quite a bit - both his private address as well as that of the shop. In 1932 the Exchange Control Office had closed down the import of almost anything but the most vital goods and in consequence he had to move the shop away from Amagertorv 1939 due to shortage. He opened a smaller shop in Nygade 4, but after a year he had to close this as well. During World War II, the shop could be found in a cellar in Badstuestræde 20, until it in 1946 opened in the present premises in Kompagnistræde 12. In 1940 he lived in Forhåbningsholms Allé 10 and moved to Kronprinsensvej 6 in 1968. Married in 1948 to Ingrid Maria Svendsen, and takes over the shop in 1976. At the same time Court Glass Merchant was changed to Purveyors to H. M. the Queen of Denmark. With his wife, Ingrid, Ib got the shop going very well, and in 1981 they were able to buy the whole property of Kompagnistræde 12. The former back premises were converted into a new and modern repair workshop for chandeliers, and a second exhibition room, primarily for one-off glass, was added to the shop. Ib and Ingrid retired in 1989. Employed with the shop 1977. In 1985 he married Annemette Nielsen, and together they took over the shop in 1989 expanding the shop activities with exhibitions in the "new room" of one-off glass, created by first-rate Danish glass artists. In 1993 the "old room" was carefully renovated, living up to all technical standards without loosing the touch of a classical glass shop. 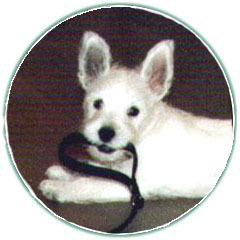 Our new dog, FREDERIK II, born June 18 2003 is also a very nice dog. Our dog, Frederik, among our regular customers known as "the manager", always came to work with us, only not on Saturdays, when he had his day off. He was born December 27 1985 and was an extremely kind and nice dog, but on October 27 1999 he couldn't go on any longer. He died at the age of 13 years and 10 months.